The Bowling Green Chamber of Commerce held its annual banquet on Thursday, Jan. 10 at the Knights of Columbus Hall in St. Clement. In addition to a delicious meal, several awards were presented and board members were installed as the chamber reviewed another successful year for the organization. 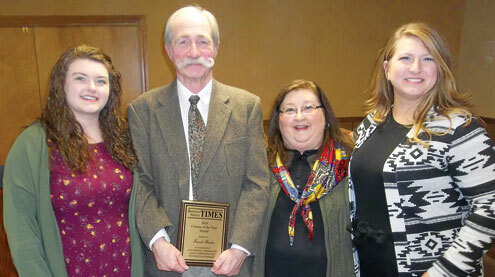 Retired educator and school administrator Frank Berlin was honored as this year’s Citizen of the Year. The recipient of the award is selected from nominations by a committee. 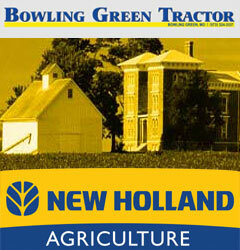 The award is sponsored by the Bowling Green Times newspaper. Berlin received a standing ovation when the award was announced. In addition to serving as an educator, Berlin has worked over the years with local service organizations and has volunteered his time through church and community groups. Attendees from the Berlin family included his wife, Kathy, their daughters, Kara and Malinka, and their five grandchildren. Former Bowling Green City Administrator Barb Allison was the recipient of the “Friend of the Chamber” award this year. Allison retired at the end of last year following many years of service to the city as administrator and clerk. The award recognizes the efforts of an individual to chamber activities. Allison was presented the award by Marianne Everhart who is her daughter and serves as the Chamber Second Vice President. The Outstanding Chamber Member of the Year award is presented to an individual who is deemed to have gone above and beyond for the organization in the past year. This year the award was presented to Chamber President Deanna Feldmann. The award was given by First Vice President Tracy Brookshier. In addition to the awards, executive officers and the board were installed. This year’s executive board members include: Feldmann (president), Brookshier (first vice president), Everhart (second vice president), Elizabeth Kingsley (treasurer) and Ruth Heffner (secretary). Board members for the coming year are Christine Rutherford, Kala Luebrecht, Colette Keith, Karen Arico, Brent Engel, Ethan Colbert, Ann Tran and Mark Stottler.